(CNN) — The level of odorous chemical in West Virginians’ water dropped Friday, but not enough for authorities to lift a warning to avoid drinking, cooking or bathing with it or to give a clear idea as to when things will change. Gov. Earl Ray Tomblin described the situation in nine counties Friday night as “pretty bad,” both for residents being told the only thing they should do with their running water is flush their toilets and schools, restaurants, hotels and other businesses forced to close. “But we’re just not sure exactly how long it’s going to take before it’s acceptable to lift the do-not-drink ban,” the governor told CNN. Much of the anger centers around the coal-industry company from which the chemical leak occurred. And there’s also frustration among some — including Danny Jones, the mayor of West Virginia’s most populated city and capital, Charleston — that the water company trying to deal with the resulting mess still doesn’t have a timeline for when things will return to normal. “It’s caused us more problems than you could ever imagine,” Jones said Friday night, pointing out people can’t do things like wash their hands after going to bathroom or wash their clothes. The crisis began Thursday, when residents of Kanawha County reported a foul odor — similar to licorice — in the air. The Kanawha County Fire Department and the state Department of Environmental Protection that day traced that smell to a leak from a 35,000-gallon storage tank along the Elk River. 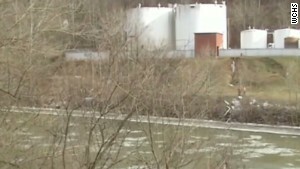 The chemical had overflowed a containment area around the tank run by Freedom Industries, then migrated over land and through the soil into the river. The leak happened about a mile upriver from the impacted West Virginia American Water Co. plant. After concluding the tap water was contaminated late Thursday afternoon, a stop-use warning went out to customers in Boone, Cabell, Clay, Jackson, Kanawha, Lincoln, Logan, Putnam and Roane counties. West Virginia American Water’s president Jeff McIntyre said Friday he didn’t believe the substance — 4-methylcyclohexane methanol — was still flowing. But that doesn’t mean the situation will be resolved soon. While there haven’t been reported widespread sicknesses, the ordeal is having a big impact. Businesses — including 15 McDonald’s in the area, according to their ownership group — have shut down. Hospitals have taken emergency measures to conserve water. And residents have been scrambling, as evidenced by empty shelves and worries at home. The emergency’s ripple effects included the closure Friday of the state Supreme Court of Appeals in Charleston, courts in Boone and Lincoln counties, and the cancellation of classes at West Virginia State University. In addition to shuttering her shop Flowers & More on Friday — usually her busiest day — Pearl noted other ripple effects, like how her 60-year-old husband’s physical therapy session tied to a recent knee surgery was canceled. “The problem is that no one seems to know when we’ll have the water restored,” she said. First responders and hospitals saw a rush of activity after the alert went out. Carper said more than 1,000 calls were placed in four or five hours to the 911 center, 24 of them for emergency medical services — five of which led to people being taken to hospitals. Many — perhaps too many — did just that. “Our emergency rooms have been very busy with individuals unnecessarily concerned and presenting no symptoms,” said Charleston Area Medical Center. The restrictions affected the hospital in other ways, too. It put into place linen conservation and alternative cleaning methods and turned away all but emergency patients. A lawsuit was filed Friday by a man whose scheduled kidney transplant was canceled due to the water issue, said attorney Jesse Forbes said. CNN reached out to the water company about the lawsuit. “West Virginia American Water is not focused on litigation at this time. Our focus is on our customers and providing safe adequate water supplies,” the company said in a statement. Freedom Industries is feeling the heat from others as well. President Gary Southern tried several times to walk away from a press conference Friday evening, saying “it has been an extremely long day,” only to be called back by insistent reporters — including one who noted how long a day it has been for all the West Virginians now without drinkable water or a full explanation as to why. Southern said two Freedom employees noticed material leaking from a storage tank into a dyke around 10:30 a.m. Thursday. They contacted authorities and began the cleanup process — including hauling away the chemical still in the tank and vacuuming up some in the nearby ground. “We have mitigated the risk, we believe, in terms of further material leaving this facility,” said the head of Freedom, which supplies products for the coal-mining industry. Southern said he couldn’t say how much of 4-methylcyclohexane methanol — which United Mine Workers spokesman Phil Smith explained is used to wash coal before it goes to market — leaked, only that it was under 35,000 gallons. Tomblin said a maximum of 5,000 gallons of the chemical seeped out. The Freedom Industries president downplayed the chemical’s health effects, saying it has “very, very low toxicity” and opining it poses no danger to the public. West Virginia American Water and government officials have a different take, as evidenced by the stop-use warning. The federal Environmental Protection Agency — which doesn’t yet have an “official role” in the response — has taken no enforcement actions against Freedom Industries during the past five years, agency spokeswoman Alisha Johnson said. West Virginia’s Department of Environmental Protection ordered Freedom to take everything out of its 11 remaining above-ground storage tanks. This came hours after the department issued a “cease operations order” for the company, saying it could not receive any additional material until it addresses the effects of the leak and proves its structures are sound. 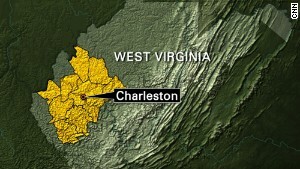 ‘Can’t say’ water’s safe in West Va.
West Virginia’s governor declared a state of emergency in nine counties. The rush now is on to fully assess and address the problem, and perhaps press criminal charges because of it. Having declared a state of emergency affecting the nine involved counties, Tomblin urged West Virginians to look out for one another — especially small children and the elderly. To that point, he announced a “call to action drive” through Friday evening at the State Capitol to collect items such as bottled water, sanitizer, liquid baby formula, paper and plastic plates and utensils for those in need. This is in addition to water stations set up in malls, churches, high schools, recreation centers and fire departments. The federal government has gotten involved as well, with President Barack Obama signed an emergency declaration authorizing the Federal Emergency Management Agency to coordinate disaster relief efforts. FEMA said Friday that it was sending 75 trucks — each carrying about 4,900 gallons of water — to the area. Tomblin said this federal help — for now, mostly in the form of cases of bottled water — is helpful, as are the contributions from many donating businesses. Meanwhile, West Virginia American Water is working intently as well, including teaming with DuPont and the U.S. Army Corps of Engineers to determine the contamination level. Jordan said the system would be flushed and may be returned to service in zones, but she would not speculate when that might occur. The water company also has provided 12 tanker trucks filled with water, and bought four tractor-trailer loads of bottled water for distribution to those in need, McIntyre said. Tomblin noted that “there is no shortage of bottled water,” but urged people to see a doctor immediately if they come down with nausea, dizziness, or eye or skin irritation. And he didn’t make any promises as to when this emergency would end. “I do not know how long this will last,” the governor said. Ultra-Pure can solve your problem! water conditioner (sales & rentals) , filters, well drilling, repairs, supplies, and water treatment supplies and chemicals, water heater installation, water freeze repair, heat tape install, pressure tanks,pumps,well cleaning, water storage systems, water testing and analysis, plumbing installs and electrical repairs, water conditioning chemicals and supplies, water coolers and Tyler Mountain Water. NOW SERVICING OIL FURNACES – CALL NOW AND START SAVING HEATING OIL! Mail,Fax or Email to our office the information below. Drinking water rich in arsenic over a long period leads to arsenic poisoning or arsenicosis. Many waters contain some arsenic and excessive concentrations are known to naturally occur in some areas. The health effects are generally delayed and the most effective preventive measure is supply of drinking water low in arsenic concentration. Absorption of arsenic through the skin is minimal and thus hand-washing, bathing, laundry, etc. with water containing arsenic do not pose human health risks. In China (Province of Taiwan) exposure to arsenic via drinking-water has been shown to cause a severe disease of the blood vessels, which leads to gangrene, known as ‘black foot disease’. This disease has not been observed in other parts of the world, and it is possible that malnutrition contributes to its development. However, studies in several countries have demonstrated that arsenic causes other, less severe forms of peripheral vascular disease. Arsenicosis is caused by the chemical arsenic. Arsenic is a toxic element that has no apparent beneficial health effects for humans. Natural arsenic salts are present in all waters but usually in only very small amounts. Most waters in the world have natural arsenic concentrations of less than 0.01 mg/litre. Arsenicosis is caused by exposure over a period of time to arsenic in drinking water. It may also be due to intake of arsenic via food or air. The multiple routes of exposure contribute to chronic poisoning. Arsenic contamination in water may also be due to industrial processes such as those involved in mining, metal refining, and timber treatment. Malnutrition may aggravate the effects of arsenic in blood vessels. WHO’s Guideline Value for arsenic in drinking water is 0.01 mg /litre. This figure is limited by the ability to analyse low concentrations of arsenic in water. Natural arsenic contamination is a cause for concern in many countries of the world including Argentina, Bangladesh, Chile, China, India, Mexico, Thailand and the United States of America. Because of the delayed health effects, poor reporting, and low levels of awareness in some communities, the extent of the adverse health problems caused by arsenic in drinking-water is unclear and not well documented. As a result there is no reliable estimate of the extent of the problem worldwide. WHO is presently collecting information in order to make such an estimate. Case reports on the situation in various countries have been compiled and the arsenic problem in Bangladesh in particular has prompted more intensive monitoring in many other countries. In Bangladesh, 27 % of shallow tube-wells have been shown to have high levels of arsenic (above 0.05mg/l). It has been estimated that 35 – 77 million of the total population of 125 million of Bangladesh are at risk of drinking contaminated water (WHO bulletin, volume 78, (9):page 1096). Approximately 1 in 100 people who drink water containing 0.05 mg arsenic per litre or more for a long period may eventually die from arsenic related cancers. Deeper wells are often less likely to be contaminated. Rain water harvesting in areas of high rainfall such as in Bangladesh. Care must be taken that collection systems are adequate and do not present risk of infection or provide breeding sites for mosquitoes. Use of arsenic removal systems in households (generally for shorter periods) and before water distribution in piped systems. Testing of water for levels of arsenic and informing users. Monitoring by health workers – people need to be checked for early signs of arsenicosis – usually skin problems in areas where arsenic in known to occur. Health education regarding harmful effects of arsenicosis and how to avoid them. People are increasingly concerned about the safety of their drinking water. As improvements in analytical methods allow us to detect impurities at very low concentrations in water, water supplies once considered pure are found to have contaminants. We cannot expect pure water, but we want safe water. The health effects of some contaminants in drinking water are not well understood, but the presence of contaminants does not mean that your health will be harmed. In North Carolina, drinking water is generally of high quality and free from significant contamination. Public water supplies are tested, and regulated to ensure that our water remains free from unsafe levels of contamination. Small private water supplies, including wells, are not regulated by drinking water standards, and the owner must take steps to test and treat the water as needed to avoid possible health risks. What is in your drinking water? The only way to know is to have it tested. Drinking water can become contaminated at the original water source, during treatment, or during distribution to the home. If your water comes from surface water (river or lake), it can be exposed to acid rain, storm water runoff, pesticide runoff, and industrial waste. This water is cleansed somewhat by exposure to sunlight, aeration, and micro-organisms in the water. If your water comes from groundwater (private wells and some public water supplies), it generally takes longer to become contaminated but the natural cleansing process also may take much longer. Groundwater moves slowly and is not exposed to sunlight, aeration, or aerobic (requiring oxygen) micro-organisms. Groundwater can be contaminated by disease-producing pathogens, leachate from landfills and septic systems, careless disposal of hazardous household products, agricultural chemicals, and leaking underground storage tanks. The levels of contaminants in drinking water are seldom high enough to cause acute (immediate) health effects. Examples of acute health effects are nausea, lung irritation, skin rash, vomiting, dizziness, and even death. Contaminants are more likely to cause chronic health effects – effects that occur long after repeated exposure to small amounts of a chemical. Examples of chronic health effects include cancer, liver and kidney damage, disorders of the nervous system, damage to the immune system, and birth defects. Evidence relating chronic health effects to specific drinking water contaminants is limited. In the absence of exact scientific information, scientists predict the likely adverse effects of chemicals in drinking water using human data from clinical reports and epidemiological studies, and laboratory animal studies. Develop a maximum contaminant level goal (MCLG) and a maximum contarninant level (MCL) for all regulated contaminants. MCLGs are nonenforceable health-based goals and represent the maximum level of a contaminant that is expected not to cause any adverse health effects over a lifetime. MCLs are enforceable contaminant levels. They are set as close to the MCLG as possible and are based on protecting public health within economical and technical reason. Increase the number of regulated contaminants to a total of 83 by June, 1989. MCLs must be set for an additional 25 contaminants every 3 years thereafter. Identify best available technologies (BATS) for removing excess contaminants from water, based on efficiency, availability, and cost. Issue variances and exceptions to systems that cannot comply with MCLs despite the application of BATS, unless an “unreasonable risk” to health exists. “Unreasonable risk” has not yet been defined. Provide for public notification when drinking water standards are violated. Ban the use of lead pipes, solder, fittings, and flux in public water systems. Bolster enforcement of penalties for violators of drinking water standards at the state and local level. Provide for protection of groundwater sources. Contaminants are regulated when they occur in drinking water supplies and are expected to threaten public health. Most levels established by the EPA allow a sufficient margin of safety, but acceptable contaminant levels vary widely among individuals and population groups. For example, high sodium levels, harmless for most people, can be dangerous for the elderly, people with high blood pressure, pregnant women, and people having difficulty in excreting sodium. North Carolina has adopted EPA standards and the state has responsibility for enforcing drinking water standards. Every day, you can be exposed to combinations of many toxic substances and these substances may interact. What is in water may represent only a small part of your overall exposure to a specific contaminant. Scientists who investigate how contaminants affect human health get information in several ways. They may study how a toxic substance has affected people in a community over time. In some cases, this can show relationship between exposure to a contaminant and a health effect They may also use animal studies to collect information on the acute and chronic health effects. Research helps scientists determine toxic doses and levels below which toxic effects are not observed. For noncancer-causing toxic substances, scientists use “acceptable daily intake” to estimate risk. The acceptable daily intake is the amount of a contaminant or toxic substance that humans can consume daily for a lifetime without any known ill effects. It includes a margin of safety. For a cancer-causing substance, no safe level has been set. Toxicity is estimated by calculating a risk estimate, or the concentration of a substance that presents the least acceptable risk. In the case of cancer-causing toxins, regulations are based on a level of risk that is acceptable, not a safe amount or concentration of a substance. Microbial Pathogens. Pathogens in drinking water are serious health risks. Pathogens are disease-producing micro-organisms, which include bacteria (such as giardia lamblia), viruses, and parasites. They get into drinking water when the water source is contaminated by sewage and animal waste, or when wells are improperly sealed and constructed. They can cause gastroenteritis, salmonella infection, dysentery, shigellosis, hepatitis, and giardiasis (a gastrointestinal infection causing diarrhea, abdominal cramps, and gas). The presence of coliform bacteria, which is generally a harmless bacteria, may indicate other contamination to the drinking water system. Trihalomthanes (THMs), which are formed when chlorine in treated drinking water combines with naturally occurring organic matter. Pesticides, including herbicides, insecticides, and fungicides. Volatile organic chemicals (VOCs), which include solvents, degreasers, adhesives, gasoline additives, and fuels additives. Some of the common VOCs are: benzene, trichloroethylene (TCE), styrene, toluene, and vinyl chloride. Possible chronic health effects include cancer, central nervous system disorders, liver and kidney damage, reproductive disorders, and birth defects. Inorganics. These contaminants include toxic metals like arsenic, barium, chromium, lead, mercury, and silver. These metals can get into your drinking water from natural sources, industrial processes, and the materials used in your plumbing system. Toxic metals are regulated in public water supplies because they can cause acute poisoning, cancer, and other health effects. Nitrate is another inorganic contaminant. The nitrate in mineral deposits, fertilizers, sewage, and animal wastes can contaminate water. Nitrate has been associated with “blue baby syndrome” in infants. Radioactive Elements. Radon is a radioactive contaminant that results from the decay of uranium in soils and rocks. It is usually more of a health concern when it enters a home as a soil gas than when it occurs in water supplies. Radon in air is associated with lung cancer. As people hear about the possibility of contaminants in their drinking water, they worry about potential health effects. Water supplies once considered to be pure may have various contaminants, often from natural sources. These are usually at levels below those considered to be harmful. If you are concerned, test your water. For more information on water quality, testing, and treatment, contact the Extension Center or health department in your county or your physician. The Westborough Water Department issued a drinking water warning Sunday night after E. coli bacteria was detected in one out of three samples collected on Aug. 16. The department said there is no emergency, but warned that residents with severely compromised immune systems, infants and some elderly individuals may be at increased risk for getting sick. Officials said the contamination was found in a sample from Westborough’s Fay Mountain water storage tank, which has been taken offline until the department determines the cause of contamination and conducts additional tests to ensure the situation is resolved. Bacterial contamination can occur when increased run-off enters the drinking water source, which often happens after heavy rain. Breaks in pipes, contamination in the storage tank itself and failures in the water treatment process can also be potential causes, the department’s warning said. Pure water has no taste, but water is a natural solvent. Most minerals from groundwater, including iron, will be absorbed by water. Large amounts of iron in drinking water can give it an unpleasant metallic taste. Iron is an essential element in human nutrition, and the health effects of iron in drinking water may include warding off fatigue and anemia. The thing that you’ll notice the most from water that is high in iron is that the water may taste metallic. The water may be discolored and appear brownish, and it may even contain sediment. Iron will leave red or orange rust stains in the sink, toilet and bathtub or shower. It can build up in your dishwasher and discolor ceramic dishes. It can also enter into the water heater and can get into the laundry equipment and cause stains on clothing. The EPA cautions that although iron in drinking water is safe to ingest, the iron sediments may contain trace impurities or harbor bacteria that can be harmful. Iron bacteria are naturally occurring organisms that can dissolve iron and some other minerals. These bacteria also form a brown slime that can build up in water pipes. Iron bacteria are most commonly problematic in wells, where water has not been chlorinated. Iron is necessary for your health. The most well-known role that iron plays in human nutrition is in the formation of the protein hemoglobin, which transports oxygen to all cells of the body. Iron is also used in cellular metabolism and is found in many of the body’s enzymes. Low iron stores in the body can lead to iron deficiency, anemia and fatigue and can make you more susceptible to infections. It is possible for you to get too much iron through your diet, but ingesting too much iron through your drinking water is not associated with adverse health effects. However, while chronically consuming large amounts of iron can lead to a condition known as iron overload; this condition is usually the result of a gene mutation that afflicts about one million people in the United States. Left untreated, iron overload can lead to hemochromatosis, a severe disease that can damage the body’s organs. Early symptoms include fatigue, weight loss, and joint pain, but if hemochromatosis is not treated, it can lead to heart disease, liver problems and diabetes. A blood test can identify iron overload. 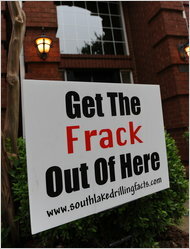 In Fort Worth, opposition to natural gas drilling and hydraulic fracturing, or fracking, has emerged. FORT WORTH — Texans pride themselves on being the heart of the nation’s oil and gas business. But even here, public concern aboutnatural gas drilling is growing. Opposition has also grown in Southlake. Analysts say the discontent appears to be partly inspired by highly publicized concerns in Pennsylvania, a state unaccustomed to drilling and where fracking has recently increased. The federal government is also raising concerns: the Environmental Protection Agency is beginning a study about the method’s effect on groundwater, and a report for Congressional Democrats released last week detailed the quantity of chemicals that gas companies are putting into the ground. Lease payments by gas companies have also dropped significantly in Texas since natural gas prices hit highs in 2008, said Mike Slattery, the director of the Institute for Environmental Studies at Texas Christian University — even as gas production rises in the state. “For the most part, I would view these as self-inflicted wounds,” said Matt Pitzarella, a spokesman for Range Resources, a drilling company, speaking about the industry generally. Gas companies, Mr. Pitzarella said, have existed under the radar for a long time but now need to be more responsive to public concerns. The Fort Worth protesters ended up at Range Resources’ offices. The company was singled out, an organizer said, partly because it is one of the drillers with headquarters in the city. Range Resources is also the subject of a battle between the E.P.A. and the Texas Railroad Commission, which regulates oil and gas operations in the state. In December the E.P.A. accused the company of contaminating two water wells in Parker County, west of Fort Worth. The driller denied the accusations, and the Railroad Commission investigated and cleared it. But the E.P.A. case is continuing. City governments are getting more involved, too. Fort Worth, which has just under 2,000 gas wells within its city limits, expects to complete a study this summer of drilling’s impact on air quality. Dallas, on the edge of the Barnett Shale, has no wells so far, but gas companies are keen to drill — hence the establishment of the task force, which may deliver recommendations to the City Council this fall. Voters in Longmont, Colo., approved a ban on the drilling practice known as hydraulic fracturing, prompting legal threats. “People really didn’t think through this too well,” the mayor said. Sam Schabacker, Kaye Fissinger and Michael Bellmont, at what would have been a drill site at Union Reservoir, worked to get the ban passed. But it has also set the city on a collision course with oil companies and the State of Colorado. In a way, Longmont’s fracking ban is in a position similar to Colorado’s ballot measure legalizing small amounts of marijuana for recreational use. Both are lessons in the promise and peril of populism: both initiatives sailed through on Election Day despite opposition from the authorities, and both now face legal scrutiny and fights at all levels of government. Gov. John W. Hickenlooper, a Democrat, has warned Longmont residents that the ban is likely to mean a lawsuit from the state, which insists that only it has the authority to regulate drilling. Already this summer, Colorado suedLongmont over earlier city rules that limit drilling near schools and homes. Local leaders are also bracing for more lawsuits as they tell energy companies they can no longer frack their wells — a process that involves injecting thousands of gallons of pressurized water, sand and chemicals deep into the earth to fissure the rock and extract the oil and gas locked inside. The ban does not outlaw all drilling, only the specific practice of hydraulic fracturing within the city limits, as well as the storage and disposal of waste created by the process. Fracking has allowed drillers to unlock huge new reservoirs of oil and natural gas over the past few years, and has kick-started economies from North Dakota to western Pennsylvania to here in northern Colorado. The industry says the practice is environmentally safe, but opponents have raised concerns about water contamination and air pollution while objecting to islands of well pads and forests of drilling towers in their communities. 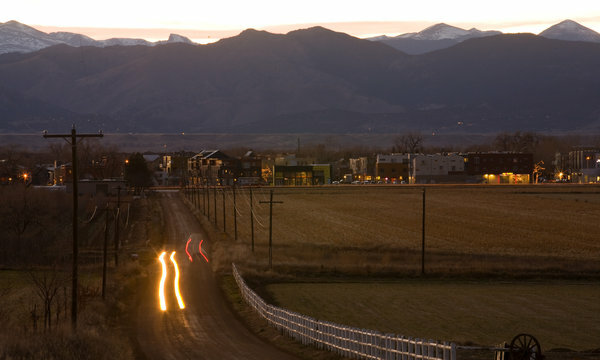 The Colorado Oil and Gas Association, the main lobbying group for the energy industry here, criticized the ban as confrontational and encroaching on the private property of companies that have rights to oil and gas buried deep beneath Longmont’s streets, parks and reservoirs. 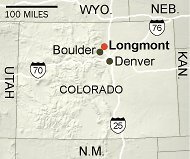 “Are the taxpayers of Longmont prepared to provide fair compensation to all of the oil and gas lease holders in Longmont?” said Tisha Schuller, the group’s president. Supporters of the ban call it a “citizen uprising” against a rush of drilling that has spread like brush fire through towns across the plains of northern Colorado. In nearby Firestone, wells sit within a few hundred feet of libraries, schools and subdivisions. In Greeley, herds of tanker trucks line up at city fire hydrants at dawn to load water for fracking. Earlier this year, a federal scientist reported finding elevated levels of propane and benzene in the air around Erie. City officials and environmental advocates have even led fracking tours of communities where drilling is at its peak. When people learned of plans to sink wells in Longmont near the Union Reservoir and a playground and recreational area on the east end of town, a response began to coalesce: not here. Supporters said the state’s decision to sue over Longmont’s regulations stiffened their resolve. At the start, the ban seemed like a doomed idea. The energy industry poured money and resources into fighting it, raising more than $500,000 to send out mailers and buy advertisements saying the ban would drive away businesses and incite expensive court battles. The major newspapers in Denver, Boulder and Longmont all urged voters to reject the proposal. “I had no idea we could upset an entire state government and a trillion-dollar industry,” said Michael Bellmont, an insurance agent who helped gather thousands of signatures and knocked on doors to persuade voters. Advocates of the ban focused less on climate change and environmental concerns than on hitting voters where they lived: Do you want oil wells venting near your backyard? Do you want drilling near your schools? 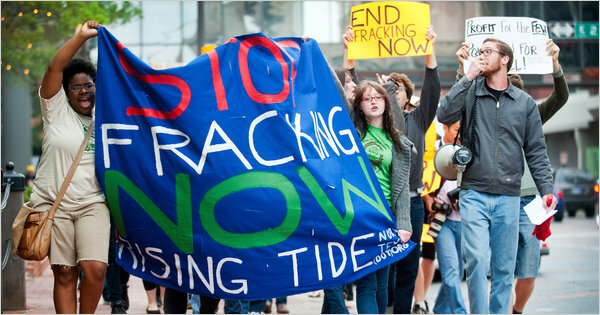 The industry said the arguments were based on fear-mongering, deception and antifracking hysteria, but they resonated with voters. The ban passed 60 percent to 40 percent, with broad bipartisan support. One recent afternoon, a few supporters who helped get the ban passed drove through town to visit some of the “red sites” — areas that had been leased for drilling, or could be in the future. They drove past public parks, open spaces and golf courses and stopped at the Union Reservoir, still and limpid under a cloudy sky. 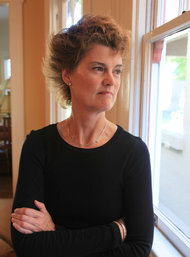 Carla Greathouse is the author of a report that documents a case of drinking water contamination from fracking. Articles in this series examine the risks of natural gas drilling and efforts to regulate this rapidly growing industry. Rex W. Tillerson, the chief executive of ExxonMobil, has said that there are no reported cases of a freshwater aquifer having ever been contaminated from hydraulic fracturing. It is a refrain that not only drilling proponents, but also state and federal lawmakers, even past and presentEnvironmental Protection Agency directors, have repeated often. Current and former E.P.A. officials say this practice continues to prevent them from fully assessing the risks of certain types of gas drilling. Eric Wohlschlegel, a spokesman for the American Petroleum Institute, dismissed the assertion that sealed settlements have hidden problems with gas drilling, and he added that countless academic, federal and state investigators conducted extensive research on groundwater contamination issues, and have found that drinking water contamination from fracking is highly improbable. “Settlements are sealed for a variety of reasons, are common in litigation, and are done at the request of both landowners and operators,” Mr. Wohlschlegel said. Still, the documented E.P.A. case, which has gone largely unnoticed for decades, includes evidence that many industry representatives were aware of it and also fought the agency’s attempts to include other cases in the final study. The report is not recent — it was published in 1987, and the contamination was discovered in 1984. Drilling technology and safeguards in well design have improved significantly since then. Nevertheless, the report does contradict what has emerged as a kind of mantra in the industry and in the government. Asked about the cause of the incident, Mr. Wohlschlegel emphasized that the important factor was that the driller and the regulator had not known about the nearby aquifer. But in comments submitted to the E.P.A. at the time about the report, the petroleum institute acknowledged that this was indeed a case of drinking water contamination from fracking. Mr. Wohlschlegel cautioned however that the comments provided at the time by the institute were not based on its own research and therefore it cannot be sure that other factors did not play a role. In their report, E.P.A. officials also wrote that Mr. Parsons’ case was highlighted as an “illustrative” example of the hazards created by this type of drilling, and that legal settlements and nondisclosure agreements prevented access to scientific documentation of other incidents. Bipartisan federal legislation before Congress would require judges to consider public health and safety before sealing court records or approving settlement agreements. Dan Derkics, a 17-year veteran of the environmental agency who oversaw research for the report, said that hundreds of other cases of drinking water contamination were found, many of which looked from preliminary investigations to have been caused by hydraulic fracturing like the one from West Virginia. But they were unable to learn more about them. The New York Times was made aware of the 1987 E.P.A. report and some of its supporting research materials by Ms. Greathouse, the study’s lead author. Other records pertaining to the well were obtained from state archives or from the agency’s library. Some industry officials criticized the research behind the report at the time. Their comments were among the dozens submitted by the industry to the agency. “It is clear from reading the 228 alleged damage cases that E.P.A.’s contractor was careless in its investigation and presentation of this material,” a letter from the American Petroleum Institute said. The organization faulted a draft of the report as failing to include enough comment from state regulators and energy companies, and as including cases that were poorly documented or outside the scope of the project. In remarks to the agency at the time, the petroleum institute also emphasized that safeguards in West Virginia had improved because of the incident, which the organization referred to as an aberration and said was potentially caused by a malfunction. “As described in the detail write-up, this is not a normal result of fracturing, as it ruins the productive capability of the wells,” the institute said about the case. A spokesman for ExxonMobil, Alan T. Jeffers, was asked about Mr. Tillerson’s comments to Congress in light of the documents relating to the West Virginia case. He said that Mr. Tillerson, whose company is the largest producer of natural gas in the United States, was only echoing what various state and federal regulators had said. On the issue of sealed settlements, Mr. Jeffers said that investigators and regulators could use subpoenas if they really wanted access to the information. Improvements in fracking have led to a boom in natural gas drilling, enabling energy companies to tap vast reserves of gas in previously inaccessible shale formations deep underground. Most drilling experts indeed have said that contamination of drinking water with fracking liquids is highly improbable. Even critics of fracking tend to agree that if wells are designed properly, drilling fluids should not affect underground drinking water. Industry officials also emphasize that all forms of drilling involve some degree of risk. The question, they say, is what represents an acceptable level. Once chemicals contaminate underground drinking-water sources, they are very difficult to remove, according to federal and industry studies. One E.P.A. official involved with a current study being conducted by the agency on the risks of fracking on drinking water said the agency encountered continuing challenges to get access to current cases because of legal settlements. “Our hands are tied,” said the official, who spoke anonymously because he is not authorized to speak to reporters. Brendan Gilfillan, a spokesman for the agency, said that it had indeed encountered these barriers but that there were still enough alternate cases to study. A 2004 study by the agency concluded that hydraulic fracturing of one kind of natural gas well — coal-bed methane wells — posed “little or no threat” to underground drinking water supplies. The study was later criticized by some within the agency as being unscientific and unduly influenced by industry. Asked about the 1987 E.P.A. report and the West Virginia well, Mr. Gilfillan said the agency was reviewing them closely. Instances of gas bubbling from fracked sites into nearby water wells have been extensively documented. The industry has also acknowledged that fracking liquids can end up in aquifers because of failures in the casing of wells, spills that occur above ground or through other factors. However, the drilling industry emphasizes that no such cases exist in which the fracking process itself caused drilling liquids to contaminate drinking water. The E.P.A.’s 1987 report does not discuss the specific pathway that the fracking fluid or gel took to get to Mr. Parsons’ water well in West Virginia or how those fluids moved from a depth of roughly 4,200 feet, where the natural gas well was fracked, to the water well, which was about 400 feet underground. However, state records not included in the agency’s final report show the existence of four abandoned wells nearby that were deeper than the fracked gas well. State inspectors and drilling experts suggested in interviews that the contamination in Mr. Parsons’ well might have been caused when fracking pushed chemicals from the gas well into nearby abandoned wells where the fracking pressure might have helped them migrate up toward the water well. This well was fracked using gas and water, and with far less pressure and water than is commonly used today. The Environmental Working Group, a research and advocacy organization, studied the Parsons case extensively over the past year, interviewing local residents and former state regulators as well as reviewing state and federal documents. The organization found at least four abandoned gas wells within 1,700 feet of the gas well Kaiser drilled on Mr. Parsons’ property and roughly the same distance from the water well. All of these abandoned wells had been plugged with cement and other materials but had some of their casing removed, which is common for such wells, according to state records. “The evidence is pretty clear that the E.P.A. got it right about this being a clear case of drinking water contamination from fracking,” said Dusty Horwitt, a lawyer from theEnvironmental Working Group who investigated the Parsons case. Mr. Parsons said in a brief interview that he could not comment on the case. Court records indicate that in 1987 he reached a settlement with the drilling company for an undisclosed amount. Ms. Greathouse, the former environmental research contractor and the lead author of the 1987 E.P.A. report, said that she and her colleagues had found “dozens” of cases that she said appeared to specifically involve drinking water contamination related to fracking. But they were unable to investigate those cases further and get access to more documents because of legal settlements. All but the Parsons case were excluded from the E.P.A. study, she said, because of pressure from industry representatives who were members of an agency working group overseeing the research. The justification for excluding the cases was usually that they lacked sufficient documentation or involved a type of contamination that was outside the scope of the study. Tags: For decades, oil and gas industry executives as well as regulators have maintained that a drilling technique known as hydraulic fracturing, or fracking, that is used for most natural gas wells has never contaminated underground drinking water.